Our guest room just got a budget makeover. Since our roommate moved out a couple of years ago, the room has served as my sewing and craft room, a place to store a million books (unartfully arranged in a closed Ikea cabinet), and the threshold for that most abhorred of things, the pre-fab aluminum sunroom that we call the Abomination. (It is referred to as such so often and exclusively that we can tell friends, "There are extra chairs on the Abomination," and no one blinks.) The room continues to serve all those roles - but recently with more panache. 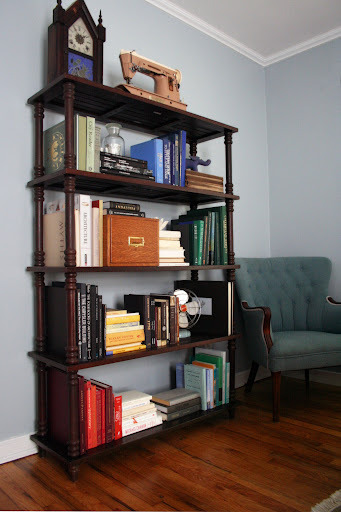 We moved out the industrial shelving and Ikea cabinet and replaced it with this bookcase from the Ballard's outlet in Atlanta, where the manager knocked off another 20% (just ask). 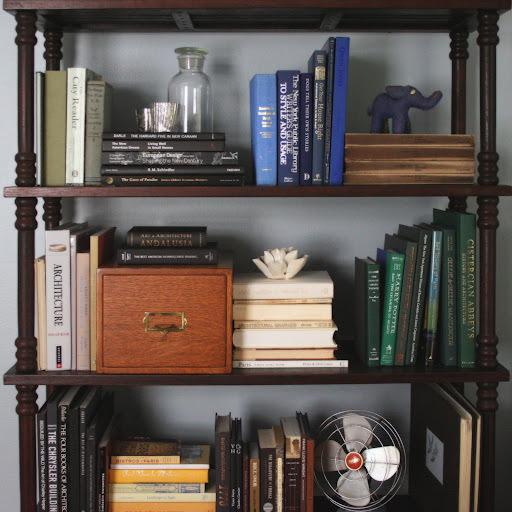 That made this sturdy, hardwood, easy-to-assemble bookcase about the same price as a particle-board number from Ikea. I arranged our prettiest books on it by color, added a few knick-knacks with no other home, and the room was already greatly improved. But there were other issues - none as pressing as the rusty steel industrial shelving once used (somewhere) to display Doc Martens, and then our books, and which now resides more appropriately in the garage - but issues nonetheless. 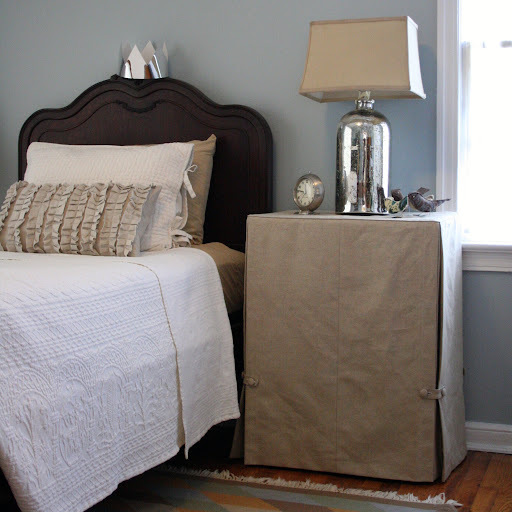 We've been substituting a bedside table with a charming old pedestal table that I spray-painted glossy white - but it didn't look or feel like a bedside table. Enter an old TV shelf of Allen's that never suited the house (but, y'know, the Doc Marten shelves totally did). 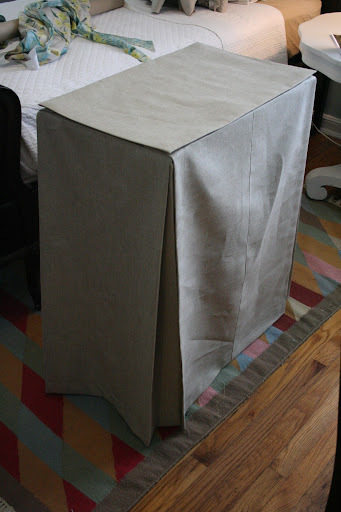 This post on Erin Ever After inspired me to make a skirted, tailored tablecloth for it. Probably everybody with an attic (or an Abomination) has a sturdy, functional table or cabinet that they're just not crazy about. The TV stand was, on its own, enough to make me ponder a yard sale several times a month - I do hate having things around that we just don't use. 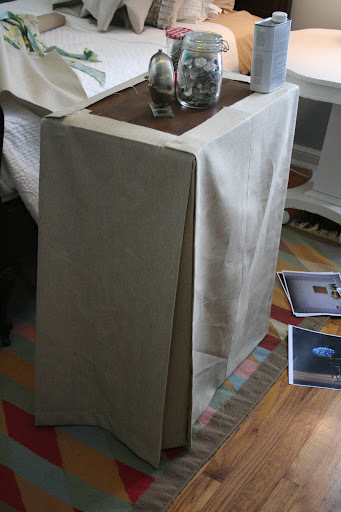 But I'm glad I didn't pawn it off, because this tablecloth was a fairly straight-forward Saturday project that made a big difference in the room. First cut out your front and back panels. Measure the front of your table and add a 2" allowance to each side (this gives generous, nice-looking hems and affords flexibility with the top when you sew it). Now cut your side panels. Measure the side of your table, and give a 2" allowance at the top and bottom. For the sides, add 6" (for a 3"-deep pleat) plus 4" (the amount that will turn the corner and run behind the front and back panels). I left the side edges of these raw. So add a 20" total allowance (10" each side) to each side panel. Now cut the top. Measure the top of your table, add 1/4" in each direction to account for the thickness of the skirt fabric, and add a 1" seam allowance. Press and stitch 2" hems at the bottom of each of your four skirt pieces (I didn't fold the hem under a second time, since the fabric is so stiff). Press and stitch 2" hems at the sides of the front and back panels. Press a 1" hem at each side of the top panel. Now arrange all the panels on your table, as if it were complete, and pin in place. 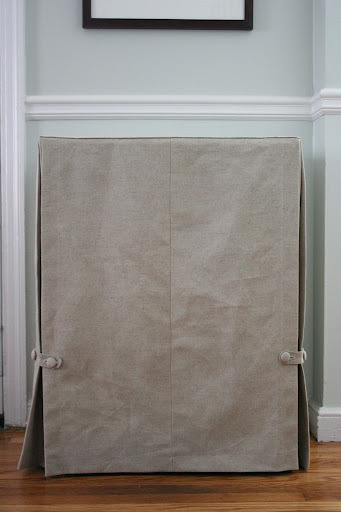 Now lay the skirt back onto the table, and pin the 4" lengths into place behind the front and back panels. Hand-stitch into place at the ends. Unless your fabric really holds a crease well, you're going to want the fasten the sides together, or they'll flop out. I used Dritz 7/8" buttons - they're easy to cover with your own fabric. I drew four 4.5"-long BandAid-like shapes and cut them out with a 3/8" allowance. I pinned each one to another small piece of fabric, and stitched along the shape, leaving one straight side open. Flip it right-side-out, and press. 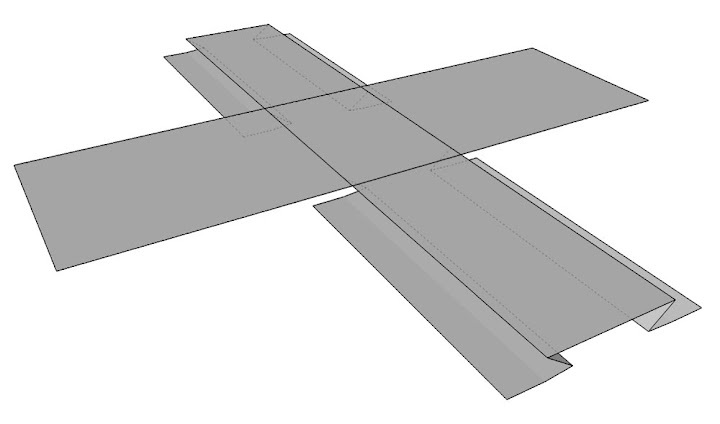 Top-stitch at the open side. Since I don't need to be able to lift up the back panel, I only gave the front panel functioning buttons - so I cut a buttonhole into two of my shapes (I did a terribly messy job; look for buttonhole instructions elsewhere). Then I pinned the shapes at one-third of the height of the table, sewed them on with a few stitches, and then sewed the buttons on. (When sewing at the side panels, make sure to stitch only through the top layer of fabric.) 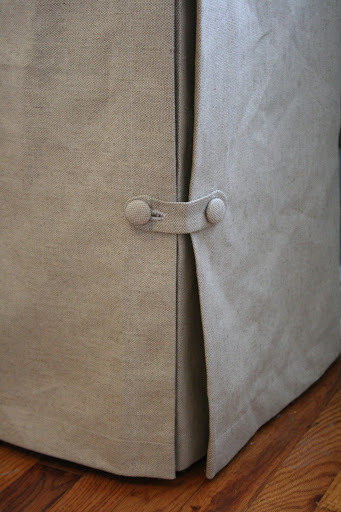 I positioned the buttonholes on the front panel, marked them with chalk, and sewed the buttons on. 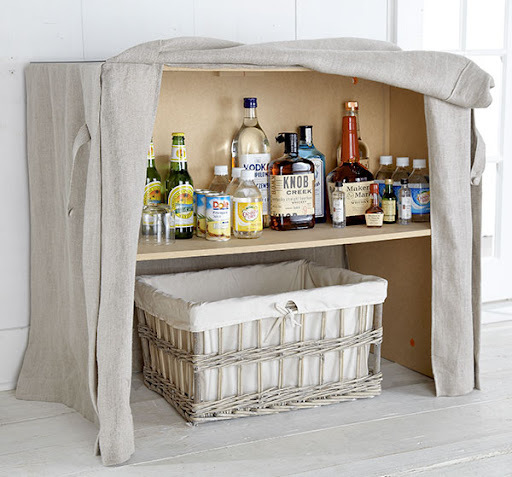 Now you can copy the Wisteria catalog's imaginary inhabitants, and stash your liquor under the tablecloth so no one will suspect that you drink. (Do WASPs not drink?) Or do what we do - proudly flaunt your lush-hood in the dining room, and stash that chintz-patterened china we got for our wedding. The lamp is another Ballard's outlet find in the throes of repair, the crown is left over from Mardi Gras, and the birds attended our wedding reception. I made the ruffled pillow using Jessica's serger. Wow, it looks really nice and easy to do. I'll try this at home. Thanks, everybody! I have tried to make these in the past, and it has stymied me. I was surprised how easy it is to do this way. The key is leaving out the flaps when you straight-stitch. They're much easier to manage when they're already positioned correctly on the table.